Celebrated as a sculptor, painter and draughtsman, Giacometti’s distinctive elongated figures are some of the most instantly recognisable works of modern art. This exhibition reasserts Giacometti’s place alongside the likes of Matisse, Picasso and Degas as one of the great painter-sculptors of the twentieth century. 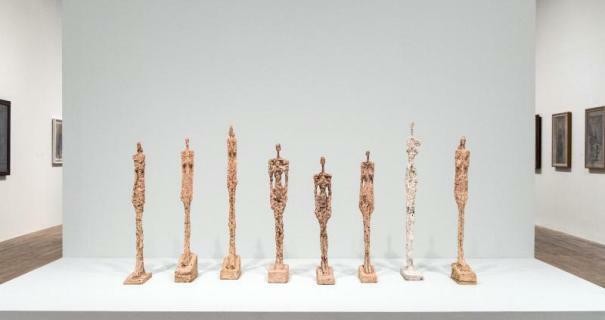 Through unparalleled access to the extraordinary collection and archive of the Fondation Alberto et Annette Giacometti, Paris, Tate Modern’s ambitious and wide-ranging exhibition brings together over 250 works. It includes rarely seen plasters and drawings which have never been exhibited before and showcases the full evolution of Giacometti’s career across five decades, from early works such as Head of a Woman [Flora Mayo] 1926 to iconic bronze sculptures such as Walking Man I 1960. This is an extract from the Tate Modern website. To find this text and further information on the exhibition, please visit : http://www.tate.org.uk/whats-on/tate-modern/exhibition/giacometti. For this exhibition, Tate Modern reunited eight plasters of the Women of Venice. It is the first time six of them are being exhibited together since their first appearance at the Venice Biennale in 1956. The exhibition will be on display until Sept.10, 2017.